When you were younger did you ever play a game with your best friend and they gave you a second chance to roll the dice.. How did you feel.. It felt great that you were able to try again didn't it..
Well, in life, the reality is, often times we aren't given second chances, whether it be taking an exam, getting rehired, or getting a call back for an audition.. However, when it does happen and you're given that opportunity, don't waste it.. Make the most of it.. If that time comes around again don't take this blessing for granted, you may never get that moment ever again. So true! I hope get and make the most of all the chances you get. PS: I somehow got unsubscribed from your blogs and just happened across one today. Exactly right. 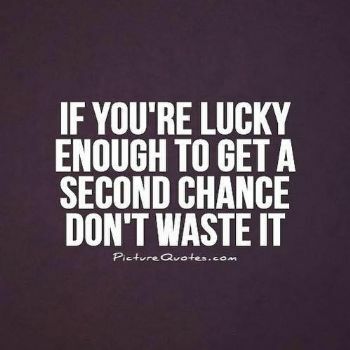 Sometimes it's hard to tell that you are getting a second chance, until you've passed it by. We need to be very alert and stay in the moment (what a tired old expression! ).